Cape May Point lighthouse is a 157 foot tall structure which is actually the third lighthouse to operate from this site at Cape May Point. Built in 1859, the original beacon consisted of oil lamps with prisms and lenses. The current beacon , producing 350,000 candlepower of light was added in 1945, and can be seen for 19 miles out to sea. 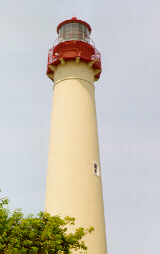 For a small fee, visitors can climb to the top of the lighthouse for a panoramic view of the Cape May peninsula. The light is part of Cape May Point State Park, located 2 miles west of the city of Cape May. The park is a 190 acre site with varied activities for visitors. The land where the park is located was used as a coastal defense base during World War II. At low tide, remains of the gun bunkers can still be seen. Most of the park (153 acres) is a natural area. Various nature trails and observation platforms for observing migrating birds and butterflys are available. There are three miles of hiking trails. Surf fishing and picnic areas are also available at the park.